1) Fixed a creature location that was stuck in the walkmesh. 2) Fixed a conversation (grammar). 4) Fixed some object descriptions that were missing. 5) Fixed a fire VFX (that was missing) and removed VFX "flicker" when active. 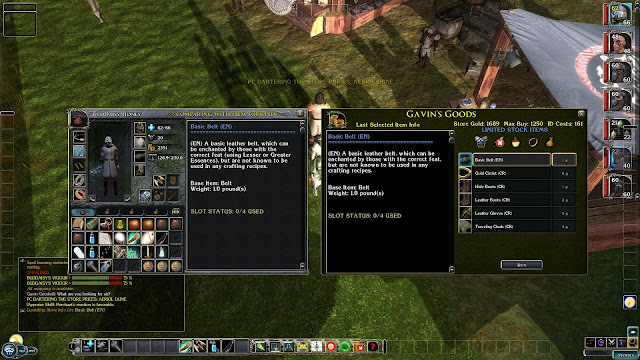 1) Update crafting system to work with crafting items no matter which PC starts the crafting procedure. The code will simply check if there is a PC in the party that meets the requirements and allow the activation to work without having to move items to the specific PC to begin with. 2) Add an inventory "search" system to list party items according to various category tabs. Currently in design discussions. I already have one of those belts thanks!